We see these everywhere, but this was the first time I saw one on the cactus. Usually I see these either as two ways. First late at night after a rainstorm. I'll take our last walk of the night. It will be usually, Rack, Kevin, and myself, and sometimes Bill and Ellie. It never fails. The last thing that snail saw was the bottom of my size 11 shoe and that was because I didn't see it. They don't actually glow in the dark and since I don't practice Jainism, I don't walk down the street with a broom to sweep my path. Although the non-violence tenet of that religion is quite appealing. The other way is when the shells have been evacuated. 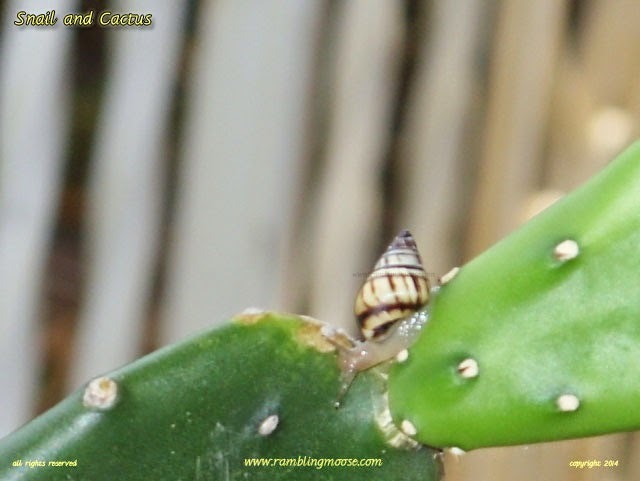 The snails will climb a vertical structure and simply remain there. At that point the shell is there, stuck to a wall, window, or the rear passenger side tire of my Jeep, and quite empty. I'm not kidding about the Jeep, these things end up everywhere. This particular little chocolate candy shaped creature was spotted when I went outside to look at an approaching thunderhead. Since they don't move very quickly, I went back inside the house, answered a phone call, and came back out with the camera. It merely continued to crawl over the surface of my cactus. I have plenty of them and have sent friends and family cuttings from the plant. Cactus is a great plant for the lazy and that's why I have it, just stick it in a pot and ignore it. Now why the chocolate companies choose to make a piece that looks like this creature is one thing, but they may have hit upon something. Chocolate does help snails remember better, so if you need to justify your cravings, perhaps this may help. Even if they aren't stuffed with Roasted Hazelnut Cream like the snail shaped Guylian Chocolates are.